GUSTAV COULD BE HEADED OUR WAY! 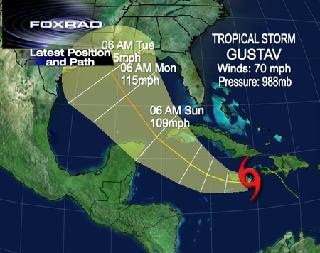 Posted in Uncategorized | Comments Off on GUSTAV COULD BE HEADED OUR WAY! ARE YOU CONCERNED BY THE TROPICAL STORM THAT COULD SOON BE A HURRICANE AGAIN? By Labor Day forecasters say Gustav could make landfall anywhere from south Texas to the Florida panhandle, and hurricane experts said everyone in between should be concerned. SOLANGE, THAT WASN’T ON TV! 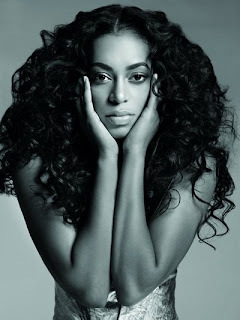 Posted in Uncategorized | Comments Off on SOLANGE, THAT WASN’T ON TV! SOLANGE: PLEASE DON’T TIE ME INTO FAMILY OR MY BROTHER-IN-LAW’S ESTABLISHEMENT! DIRECTOR: THAT WASN’T LIVE SOLANGE THAT WASN’T ON TV! I felt really bad for Solange Knowles when I saw her interview on a Las Vegas television station Wednesday night. Apparently, she heard an introduction that didn’t air on the live morning show. It was an introduction Ms. Knowles didn’t like so she confronted the morning anchor. The only problem, the introduction never hit air. The only person who brought up the issue in the interview that Solange didn’t want to talk about was Solange. To see the televised moment click the link below. I do applaud Solange for saying what she feels but next time she should make sure it was on air before going after someone on live tv! ALEX JONES: WHERE IS THAT MONSTER MICHELLE MALKIN FROM FOX NEWS – DANG! Posted in Uncategorized | Comments Off on ALEX JONES: WHERE IS THAT MONSTER MICHELLE MALKIN FROM FOX NEWS – DANG! THIS IS HOW TOUGH IT IS FOR HILLARY CLINTON SUPPORTERS – EXCELLENT LIVE INTERVIEW ON TELEVISION! Posted in Uncategorized | Comments Off on THIS IS HOW TOUGH IT IS FOR HILLARY CLINTON SUPPORTERS – EXCELLENT LIVE INTERVIEW ON TELEVISION! IT’S OFFICIAL – OBAMA IS THE DEMOCRATIC PARTY NOMINEE FOR PRESIDENT! 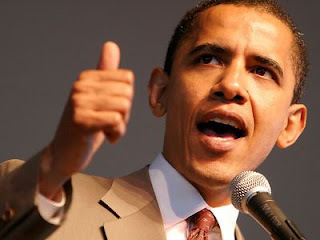 Posted in Uncategorized | Comments Off on IT’S OFFICIAL – OBAMA IS THE DEMOCRATIC PARTY NOMINEE FOR PRESIDENT! Sen. Barack Obama, D-Ill., formally received the Democratic Party’s presidential nod Wednesday evening, becoming the first African-American in U.S. history to be nominated for president by a major party. In a tightly choreographed move orchestrated by the Obama and Clinton camps, the Illinois senator became the Democratic Party’s presidential nominee when Sen. Hillary Clinton, D-N.Y., asked the delegates attending the Democratic National Convention in Denver, Colo., to make Obama the nominee by acclamation. “Let’s declare together in one voice right here, right now that Barack Obama is our candidate and he will be our president,” said Clinton. Clinton joined the New York delegation on the floor of the convention when the roll call of the states stood at 1549.5 votes for Obama and 341.5 for Clinton. IT’S TIME FOR ROCK THE BAYOU IN HOUSTON! 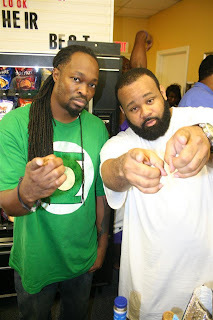 Posted in Uncategorized | Comments Off on IT’S TIME FOR ROCK THE BAYOU IN HOUSTON! ARE YOU HEADED OUT TO THE BIG EVENT! The Rock the Bayou Concert series will begin Friday, August 29, 2008 at 9:30 a.m. and will run through Monday, September 1, 2008. This four day music festival has more than 100 bands scheduled to appear on four stages beginning on Friday, August 29, 2008 at 11:30 a.m. This event will be held at the former Astroworld site, south of 610 bordered by Fannin and Kirby. The event is anticipated to have 50,000 fans per day on site and will include camping for the attendees who will be utilizing recreational vehicles, trailers and tents. Security for this festival will be provided by the Houston Police Department with continuous staffing throughout the event. HPD NEEDS YOUR HELP TO FIND A SUSPECT! 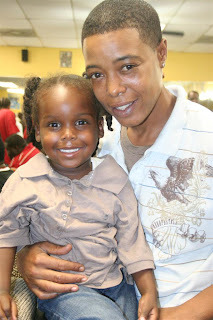 Posted in Uncategorized | Comments Off on HPD NEEDS YOUR HELP TO FIND A SUSPECT! HAVE YOU SEEN CRUZ CHAVEZ LATELY? Houston police are asking for the public’s assistance in locating a suspect wanted in the fatal stabbing of a man at 8650 Pitner about 12 a.m. Monday (August 25). 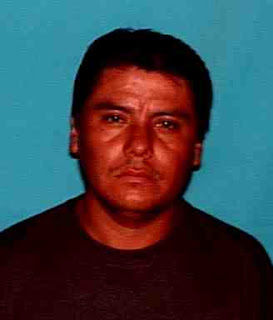 The suspect, Cruz Crisoforo Chavez (H/m, DOB: 11-24-76), is charged with murder in the 263rd State District Court. A photo of suspect Chavez is attached to this news release. The victim, Jose Lopez-Rubio, 25, suffered a stab wound to his right rib cage area and was transported in critical condition to Ben Taub General Hospital where he underwent surgery. Doctors pronounced him dead later that same morning. A witness reported seeing Lopez-Rubio and Chavez involved in a physical altercation near the garbage dumpsters and soon after, Lopez-Rubio stumble from the location. Chavez went to his apartment to retrieve a knife, which he used to stab the victim. Chavez was then seen going to another apartment within the complex while Lopez-Rubio went to the front of the complex, where HFD paramedics found him. Chavez remains at large. Anyone with information regarding the whereabouts of Cruz Crisoforo Chavez is urged to contact the HPD Homicide Division at 713-308-3600 or Crime Stoppers at 713-222-TIPS. SAY IT AIN’T SO: OUR LADIES ARE SOME OF THE MEANEST IN WASHINGTON? Posted in Uncategorized | Comments Off on SAY IT AIN’T SO: OUR LADIES ARE SOME OF THE MEANEST IN WASHINGTON? WHEN YOU DON’T WANT TO BE NUMBER #1 ON THE LIST! A recent survey in Washington DC sends a very bad message for our Texas lawmakers. The participants of the poll all work in DC and the government. That survey indicates our favorite ladies from Texas apparently have a reputation of being very mean. 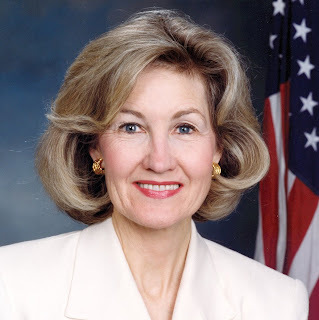 Topping a list of mean Senators is Kay Bailey Hutchinson. 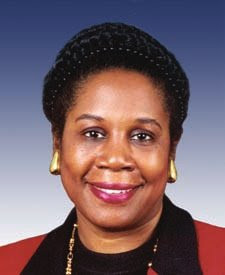 On the Congressional side is Sheila Jackson Lee. Do you know these women to be mean or downright evil as some have claimed in the DC survey? The Insite would love to hear from you! YOU CAN SEE THE OZONE AWARDS ON TELEVISION! Posted in Uncategorized | Comments Off on YOU CAN SEE THE OZONE AWARDS ON TELEVISION! 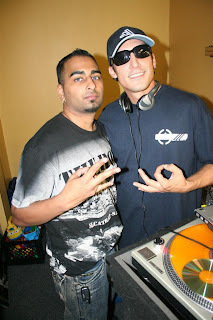 EACH NIGHT IS HOSTED BY A BIG NAME FROM THE RAP INDUSTRY! 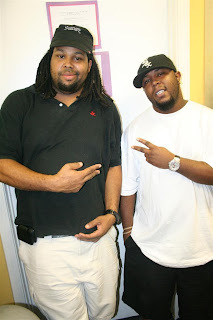 MTV and OZONE Magazine will host the ’08 OZONE Awards Week beginning this week, August 25th until the Labor Day weekend, August 31st on MTV Jams [check local listings for air times]. Exclusive footage from the 3rd annual OZONE Awards and TJs DJs Tastemakers Only Music Conference will air throughout this week on MTV Jams. Each day a new host will showcase different countdowns, ozone-inspired lists and talk about why the awards are important (see schedule below). R20;The 2008 OZONE Awards was a successful celebration of Southern Hip Hop culture and chance to recognize Houston‘s unique contributions to Southern music. Partnering with MTV has created more awareness about the show’s importance and given light to the talented artists represented by the south,” says Julia Beverly, CEO and Founder of OZONE Magazine. 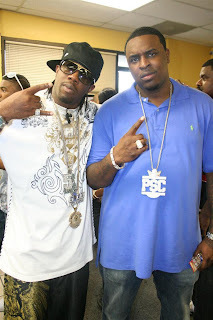 Additionally, MTV News and MTV Jams will also be airing portions of the show’s performances including Shawty Lo, the Pimp C Tribute Set (featuring Big Boi of Outkast, David Banner, Too Short, Webbie & Boosie, 8Ball, & Hezeleo), its West Coast set (featuring Too Short, Mistah FAB, & Glasses Malone), and a Florida set (featuring T-Pain, Rick Ross, DJ Khaled, Brisco, & more). 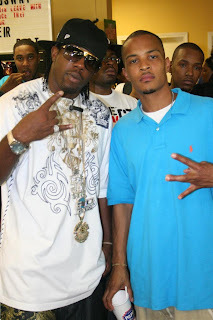 DID YOU GET TO MEET RAPPER T.I. WHEN HE WAS IN HOUSTON? 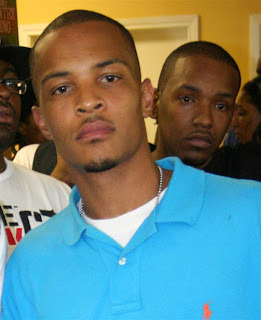 Posted in Uncategorized | Comments Off on DID YOU GET TO MEET RAPPER T.I. WHEN HE WAS IN HOUSTON? IT’S TIME TO BOX THE VOTE! 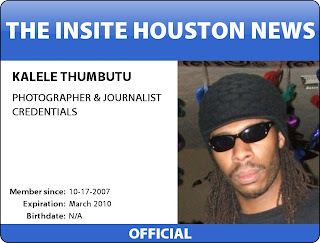 By: Kalele ‘Party King’ Thumbutu – Many Houstonians were aware that successful rap artist and entertainer TI was in town last week as part of the Box the Vote concert series put on by 97.9 the Box. The concert series is a push to get the public involved in the voting process and rewards the public by allowing the first 2000 registered voters free admittance to the concert. What many Houstonians don’t know about TI’s visit to Houston was that he was also here to promote his 6th album “Paper Trail” due to hit stores September 30th. 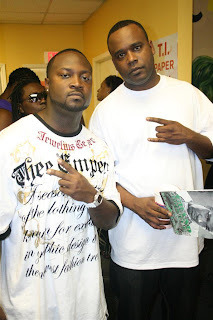 TI held a listening party at Old School with a Twist Barber Studio (8389 Almeda Rd Suite J) for not only himself but also for his Grand Hustle Records label mate Big Kuntry King who’s album “My Turn to Eat “ is also set for release on September 30th. Both artists introduced several songs off their soon to be released albums by giving a brief description of them and by explaining the inspiration behind their work. Barbershop patrons and listening party attendees alike were definitely treated by this up-close and personal experience with both artists. 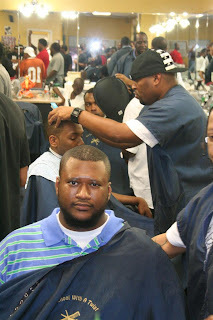 Special recognition also goes out to both Grand Hustle Records and The Go DJ’s for paying for the children in attendance haircuts which were just in time for the start of the new school year. THE SOUTHERN UNIVERSITY JAGUARS PREPARE TO TAKE OVER HY-TOWN THIS WEEKEND! 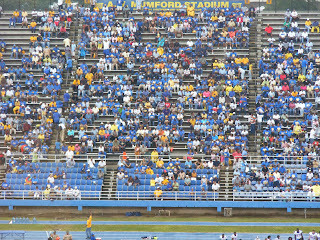 Posted in Uncategorized | Comments Off on THE SOUTHERN UNIVERSITY JAGUARS PREPARE TO TAKE OVER HY-TOWN THIS WEEKEND! THE PUBLIC IS INVITED TO ATTEND – COME PARTY LOUISIANA STYLE! The Houston, TX Alumni Chapter welcomes everyone to stop by our tent, grab a bite to eat and update your membership information before you head over to the stadium. The tailgate zone will be located in the 15C parking lot on Holman Street next to Hofheinz Pavilion, just north of the football stadium. Join us in a festive, fun, family atmosphere as we show the Cougars how it’s done! NAGIN CUTS HIS DNC TRIP SHORT BECAUSE OF GUSTAV! Posted in Uncategorized | Comments Off on NAGIN CUTS HIS DNC TRIP SHORT BECAUSE OF GUSTAV! 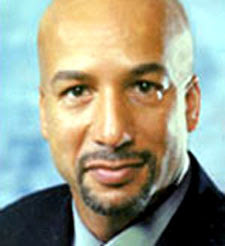 New Orleans Mayor C. Ray Nagin, who was a key speaker this morning for the Oregon, Washington and Minnesota delegations at the Democratic National Convention, has decided to return to New Orleans immediately to closely monitor Hurricane Gustav. Gustav, which has hit the southwest coast of Haiti and is threatening Cuba, appears to be on a likely course toward the U.S. Gulf region. The area, which will mark its third anniversary of the devastation of Hurricanes Katrina and Rita on August 29, is still in the recovery stages. “While it is too early to tell exactly where Gustav will hit and how strong it will be, I’m deeply concerned about the emotional and psychological effect on our citizens,” said Nagin. “Although we have made strong strides in rebuilding our infrastructure, the levees have not been fully repaired and we have an $800 million budget gap to complete our sewage and water systems,” Mayor Nagin continued. The city of New Orleans has been lobbying the federal government for this funding to revitalize the area for three years and has received less than 50 percent of FEMA funding needed to repair or rebuild key public facilities. In May of this year, the City of New Orleans received notification that it will finally receive Community Development Block Grants (CDBG) that was promised by the federal government. The Mayor is urging New Orleans city residents to visit www.cityofNO.com for updated hurricane information. New Orleans citizens can also register for the City assisted evacuation plan by calling 311, 504-658-2299 or 877-286-6431. Hearing impaired can call 800-981-6622. The 311 helpline offers assistance in both Spanish and Vietnamese.